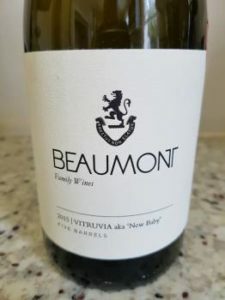 The Vitruvia aka New Baby 2015 (yes, we also wonder about the name) from Beaumont in Bot River is another compelling argument for the emerging category that is Cape White Blends or multi-variety wines built around Chenin Blanc. This consists of 35% Chenin Blanc, 24% Sauvignon Blanc, 14% Semillon, 13.5% Chardonnay and 13.5% Colombard and was matured for 12 months in 400-litre French oak barrels, 30% new. The nose is extraordinarily multifaceted – notes of yellow apple, naartjie and white peach, dried herbs, ginger and other spices plus some yeasty complexity; the palate meanwhile displays generous fruit with soft but sufficient acidity, the finish suitably dry. A suave and sophisticated offering. Wine Cellar price: R295 a bottle.